I can’t help but feel that this bio worked a bit better for Beetle than it did for Tombstone. I mean, do filed teeth and access to a gym really qualify as “artificial enhancements?” Seems a bit questionable to me. As you’ve no doubt pieced together, today’s focus figure is Tombstone. He’s a Spider-Man villain. He’s albino. He was created in 1988. I don’t know a whole lot about him. My knowledge of Spidey foes is generally from very early in his career or very recently in his career. Late ‘80s additions don’t really fall into that category, leaving old Tombstone here out in the cold. But he’s got a Marvel Legend, and I bought it, so here he is, I guess. 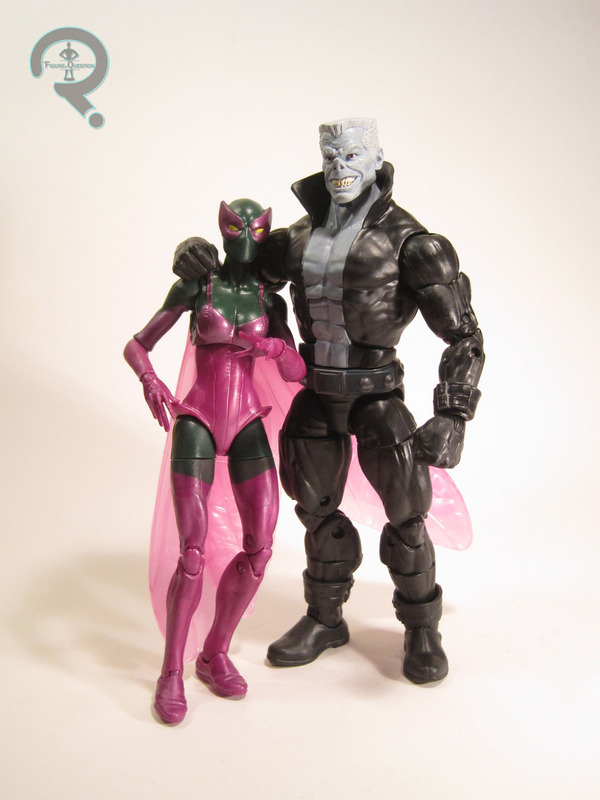 Tombstone is figure 5 in the Vulture Series of Marvel Legends. His official name is “Sinister Villains,” which he shares with the previously reviewed Beetle. While he doesn’t really have any ties to the classic Beetle, the most recent Beetle is his daughter, so that’s something. The figure stands about 7 inches tall and he has 32 points of articulation. 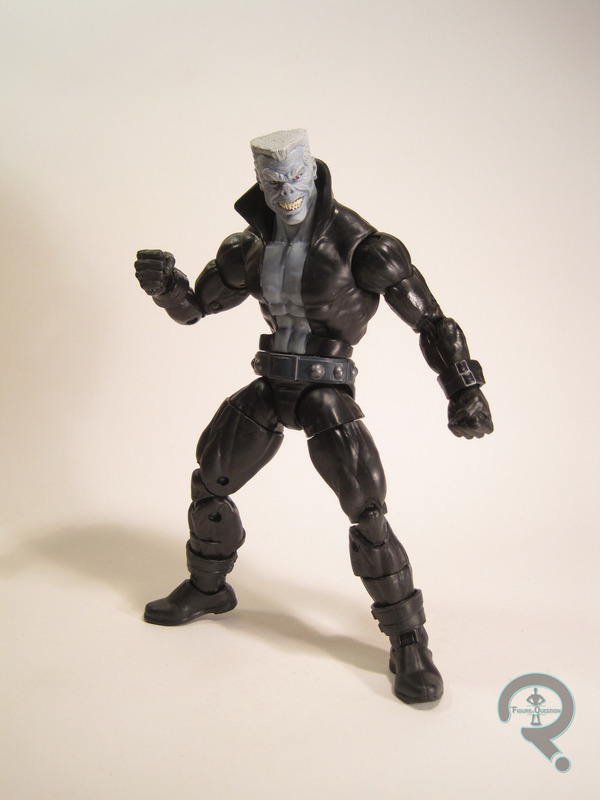 Tombstone is often seen in a suit and tie in the comics, but this particular figure is based instead on his high-collared jumpsuit look he was sporting into the early ‘90s. It’s not a favorite of mine, but neither is Tombstone. The choice of costume is most likely due to ease of parts re-use. The jumpsuit-ed look allows for Tombstone to make use of the Hyperion body. The body isn’t without its flaws, but most of them were relegated to the torso. As luck would have it, the upper and lower torso and the pelvis on this figure are new, which really breaths a lot of new life into the mold. The weird pectoral shelf thingy is gone, and the proportions just seem more balanced in general. He’s also got a new head sculpt, which is actually a pretty awesome piece. The detail work is all really sharp, and his evil grin looks really cool. In addition to the head and torso, Tombstone’s also got add-ons for his arm and leg straps, which work well enough, though they have to be put back into place every so often. The paint work on Tombstone is pretty decent. It’s mostly just black plastic, but the work on his head and torso is actually quite impressive. Tombstone has no accessories of his own, but he does include the all important second turbine for Vulture’s wings. 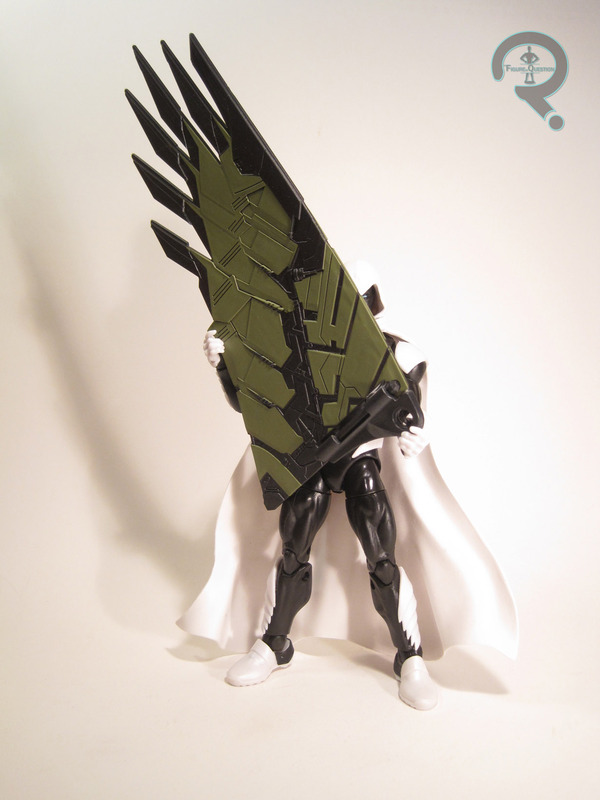 Really, I only bought this figure for the Vulture wing piece. Like I said, I’ve never been much of a Tombstone fan. I saw this figure several times while searching for the rest of the series, but never picked him up, since I figured I’d get him later. Then I got the rest of the series, and all of the sudden I couldn’t find Tombstone. Fortunately, Amazon was my friend on this one, and I was able to get him for below retail even! For a character I don’t have any attachment to, he does at least make a decent enough figure. Yay! 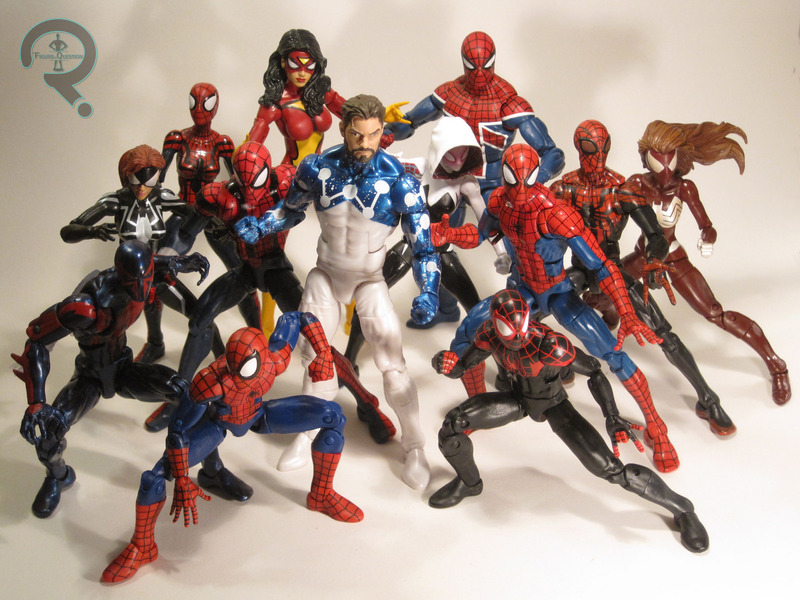 More Spider-Man Marvel Legends! Specifically of the Homecoming variety. I haven’t yet taken a look at any of the specifically Homecoming-based Legends yet, but I’m changing that with today’s review. Today, I’ll be taking a look at the main figure of the film’s titular hero, Spider-Man! Let’s see how he turned out! Spider-Man is figure 1 in the Vulture Series of Marvel Legends. This is one of two Homecoming-based Spider-Men in this particular series. This one represents his Stark-designed suit, which is just a slight variation of his classic comics suit. The figure stands a little under 6 inches tall and he has 32 points of articulation. This figure makes use of a lot of pieces from the Spidey released in the Civil War 3-pack from last year. He does get a new upper torso, upper arms, and two new heads, which help to fix a number of issues present in that figure’s sculpt. There are still a few issues present with the final product (the small shoulders and the slightly short arms are really the biggest standouts), but the overall figure looks a lot better this time. On the plus side of things, the details on the costume all match up pretty well with the on-screen counterpart. 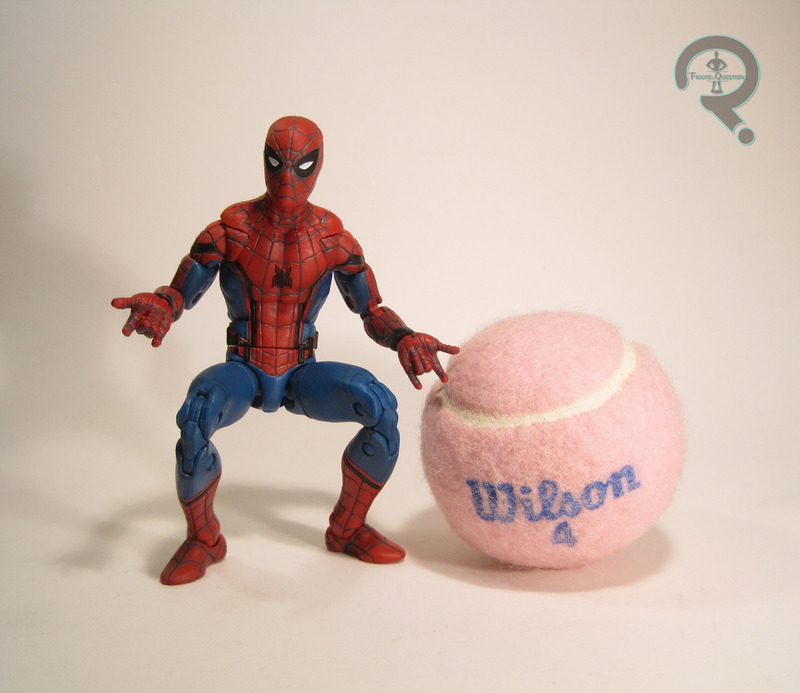 The posablity is also really top notch; there are few Spider-related poses that this guy can’t pull off. The two swappable heads included with this guy help to replicate a feature that most Spider-Man figures overlook: changing expressions on the eyes. It was one of the cooler features added to the new Spidey suit for the MCU redesign, so it’s nice to see it carried over to the figure. The first head has the eyes widespread, in a sort of Mark Bagley style, while the second has them closed tighter, looking more like Steve Ditko’s take on the character. Honestly, I can’t quite pick which of the two I prefer; I definitely foresee these two heads being swapped out rather frequently on my figure. 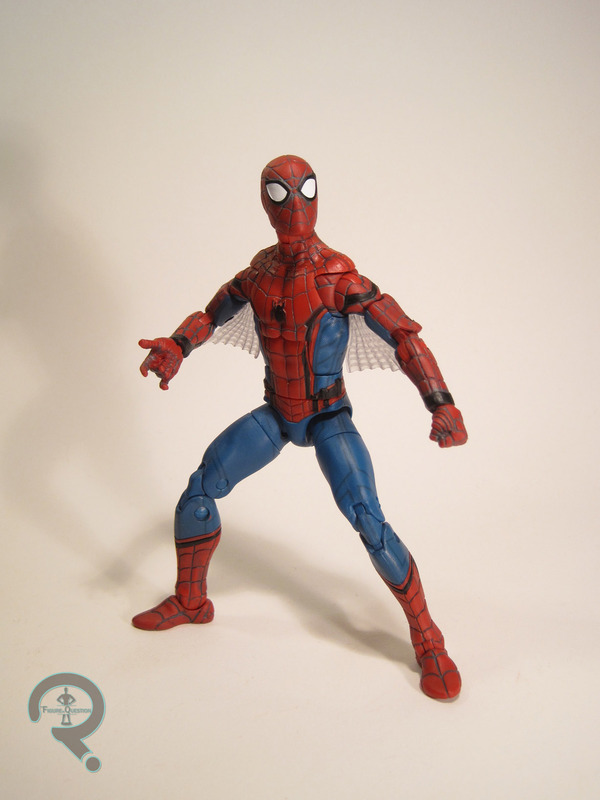 Another addition to this figure from the prior release are the “web-wings.” When Spidey debuted, he had these wings on his costume, and the film managed to work them in a nifty little way. 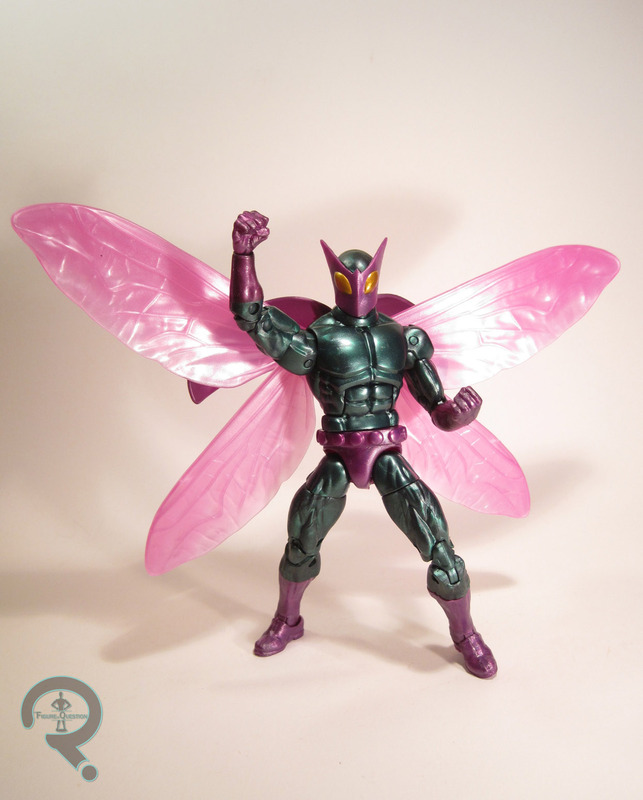 The figure has removable wings that mount under the biceps, similar to how they were handled on Spider-Woman from the Thanos Series. They don’t stay in place anywhere near as well, though, and they fall out a lot. So, they aren’t really practical for long-term use. Fortunately, they’re totally removable, and the figure’s still pretty awesome without them. The paintwork on this guy is pretty solid; the colors are fairly bold, and the application is mostly pretty sharp. In addition to the previously mentioned extra head and web wings, Spider-Man includes two pairs of hands in both web-shooting and fist poses, as well as the mid-section of Vulture’s left wing. Patience is definitely a virtue. When the Civil War 3-pack hit with its exclusive Spidey, I decided to hold off, guessing that we’d be getting another variation of that costume when Homecoming hit theaters. And look at that, I was right. I won’t let it go to my head, I swear. I found this guy after several days of checking the same few Targets, watching as they added one single new figure at a time to the shelves. He’s not a perfect figure, but he continues Hasbro’s trend of just genuinely fun Spider-Man Legends figures. Freaking finally! That took forever didn’t it? 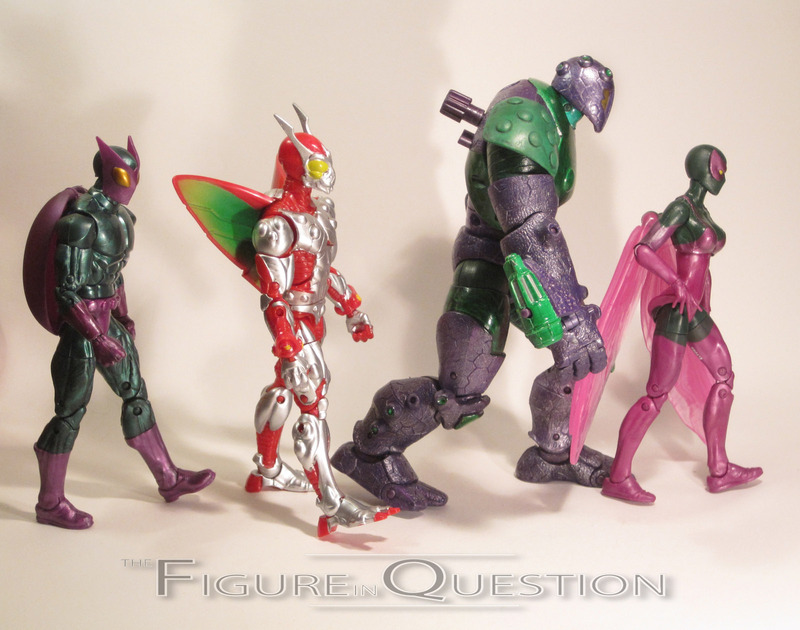 Can we address the insanity that is having to get four Legends-style figures of admittedly lower tier villain the Beetle before we actually got the version of the character that 99% of people who have any clue about the Beetle would be expecting? Because it’s kind of nuts. All I can figure is that Hasbro’s just a real big fan of running gags, and consistently delivering the wrong Beetle was just the best one they had going. But it’s finally over now, and I finally have the Beetle figure I’ve been patiently waiting for. Yay! 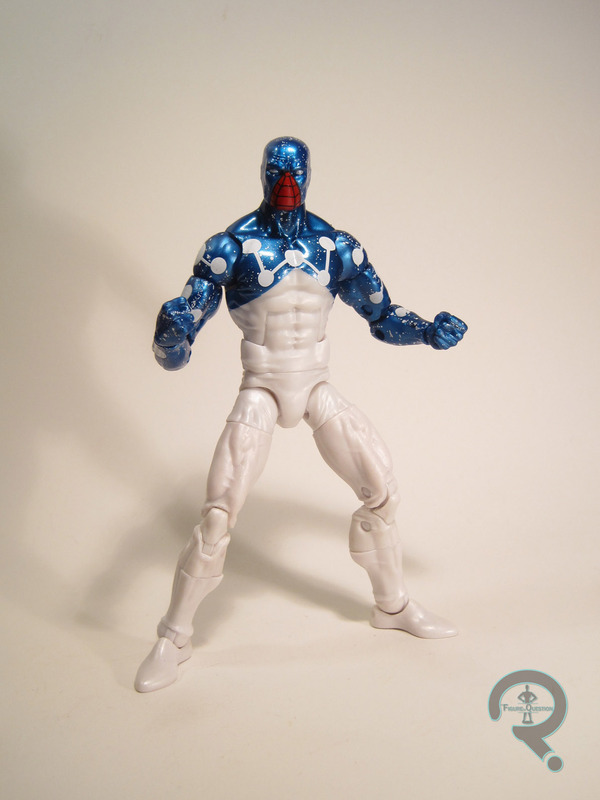 Beetle is figure 7 in the Homecoming-tie-in assortment of Marvel Legends. He’s officially named “Sinister Villains,” a name he shares with Tombstone. I guess it works okay for Beetle, though I’m not sure sinister’s at the top of the list of words I’d use to describe Abner. I got the figure, so I’m not gonna complain about the name. 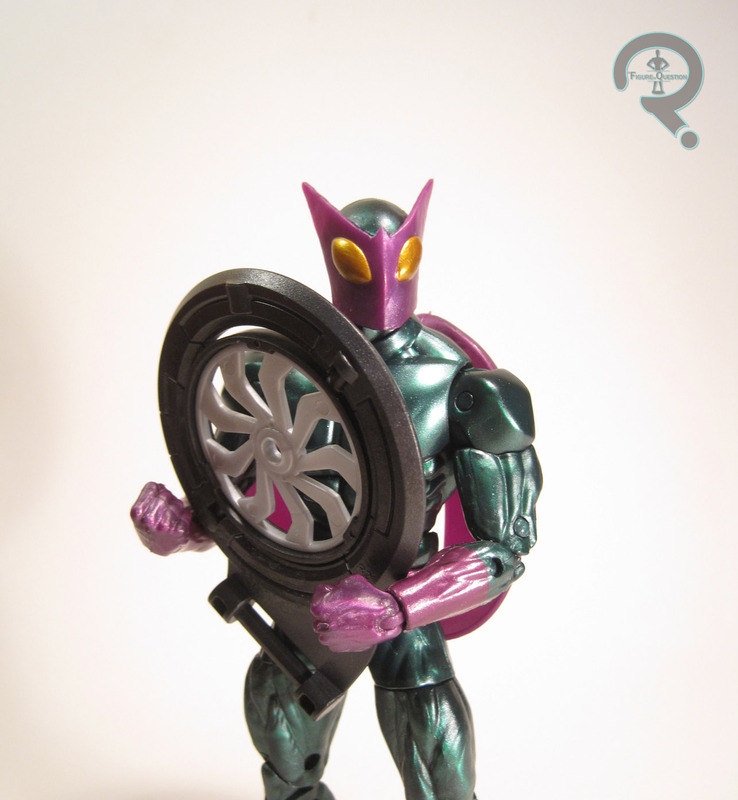 This Beetle figure is based on Abner Jenkins’ Mark II Beetle armor. It’s the design he sported throughout the ‘70s and ‘80s, and even into the ‘90s. It’s definitely his most prominent design, as well as his strongest. 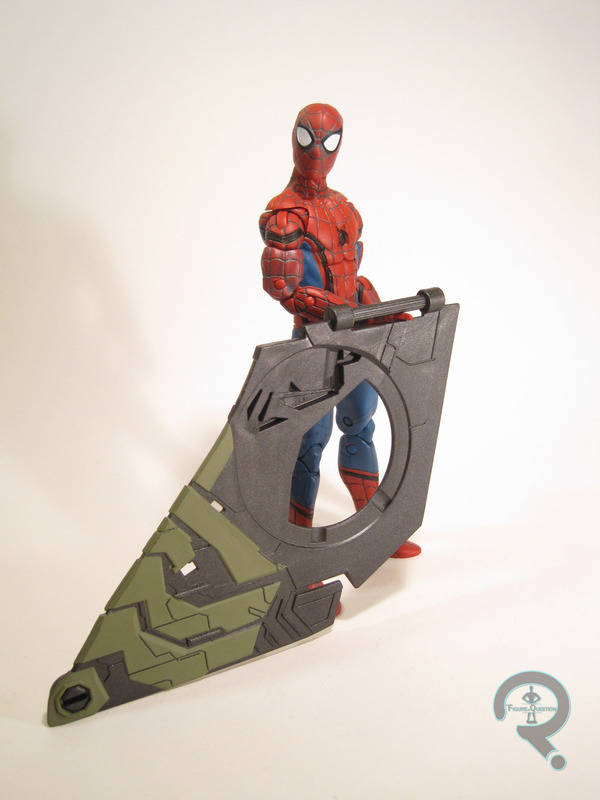 This marks only the second time this design’s appeared as a toy, following the one from the ‘90s Spider-Man line. This figure stands about 6 1/2 inches tall and he has 32 points of articulation. Beetle is built on the Bucky Cap body, or at least a lot of parts derived from it. The legs and most of the arms are the standard Bucky Cap pieces. 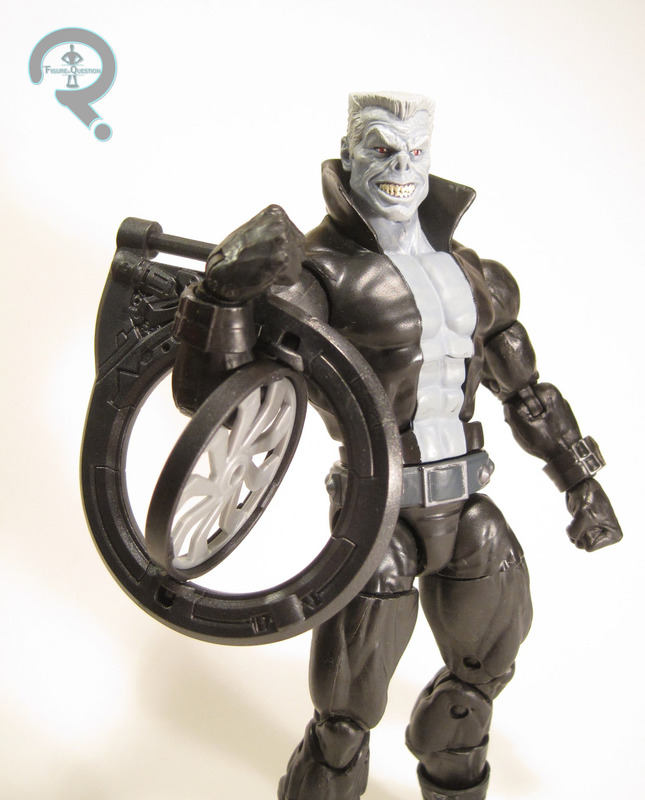 In addition, he’s got Taskmaster’s shoulders, as well as the lower torso of Darkhawk. On top of all that, he’s got a new head, upper torso, and pelvis. The head’s a fantastic piece, even better than the old Toy Biz figure’s. It’s sharp, clean, and very nicely scaled for the body. The pelvis piece is really just a slightly tweaked version of the pelvis used on Darkhawk, just with Beetle’s belt added on. The new torso mimics the slightly squared-off nature of the shoulders (aiding in selling this as armor, rather than a spandex jumpsuit), and has two sets of ports on the back for Beetle’s wings and forewings to plug into. The basic wings are the same ones used on the last Beetle, who in turn got them from Wasp. They were good pieces both times before, and that certainly hasn’t changed now. The forewings (which, fun fact, are also known as “elytra” or wing cases) are new to this figure, and can be used in conjunction with or independently of the larger wings. Personally, I kind of dig the folded up look. Beetle’s paintwork is really great. He’s done up in all metallic shades, which looks super sleek, and all of the application is really sharp. 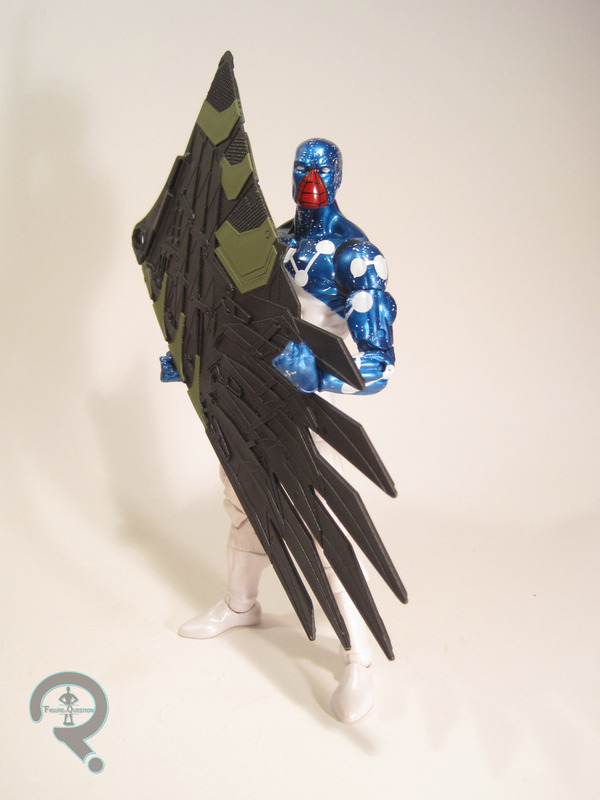 Beyond the wings, Beetle has no real accessories of his own, but he does include one of the Vulture’s wing-turbines. That’s pretty nifty, I guess. This assortment’s line-up was actually leaked a little while before the prototypes were shown off at Toy Fair. All we had to go on was the names. When Beetle showed up on the list, I was pretty sure it was this version, but not certain. I’ve been tricked before. Maybe Hasbro would drag us along one more time and roll out a first appearance Beetle. Maybe they’re sadistic like that. So, when this guy was shown off, it was like a great weight had finally been lifted. I was pretty pumped. Beetle’s actually the very first figure I found from this series. I didn’t buy that one, due to not having the money on me at the time, but I found this one about a week later, right after seeing Homecoming for the second time, in fact. After Moon Knight, he was my biggest want from this series. I’m glad I found him before Moon Knight, because it allowed me to enjoy him on his own, and not just play second fiddle. This figure’s really great. Another strong figure in a line-up of very strong figures. And now I finally have the Beetle figure I’ve been waiting on for twelve years. So, as you may have pieced together from my review of Moon Knight yesterday, I’ve finally tracked down the entirety of the latest Spider-Man Series of Marvel Legends. This particular series is about half Spider-Men variants, so I’ll be alternating between Spider-Men and non-Spider-Men. Today’s Spider-Variant actually has roots in another toyline: Micronauts. Marvel’s tie-in comic for the line added a whole lot of original concepts, including the Uni-Power, an extra-dimensional force that imbues its host with the great cosmic power, thus transforming them into Captain Universe. The Uni-Power’s been passed around a lot; that’s kind of part of its gimmick. One of the hosts was Peter Parker, because that’s what happens when you sell the most comics. That’s where today’s figure comes into play. Spider-Man (that’s what the packaging says; just “Spider-Man.” How is the average consumer to know of is cosmic-ness?) was released in the Homecoming-tie-in series of Marvel Legends. In the main universe, Peter gave up the Uni-Power, but there have been a couple of alternate universe versions of him that didn’t. This figure appears to take the most influence from the Peter Parker of Earth-13, who played a decent role in the “Spider-Verse” event. The figure stands about 6 1/2 inches tall and he has 32 points of articulation. This guy marks the second use of the Spider-UK body. It befits the more powerful and experienced nature of the Earth-13 Peter, and it’s still a favorite of mine. I hope we see it used for more than just Spider-Men moving forward. The standard masked head is pretty basic; I won’t be surprised to see it turn up on other masked characters. It’s a decent enough piece, I guess. I wish the chin were just a little more pronounced, but it’s a minor complaint. There are two additional heads. The first is an unmasked Parker, whose beard signifies that is definitely the Earth-13 version. He’s not directly patterned on the art of Oliver Copiel (who drew most of Earth-13 Peter’s appearances), going instead for a more general look. It’s a very nice sculpt, and one of Hasbro’s better human heads. 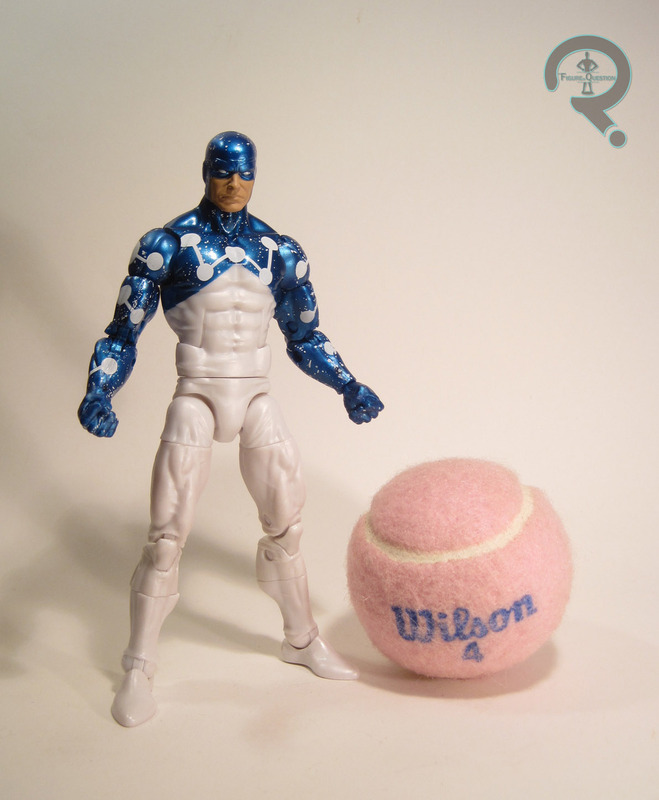 The second head isn’t a Spider-Man head at all; instead, it’s a more generic Captain Universe head, allowing for this figure to pass for a number of the Uni-Power’s other hosts. 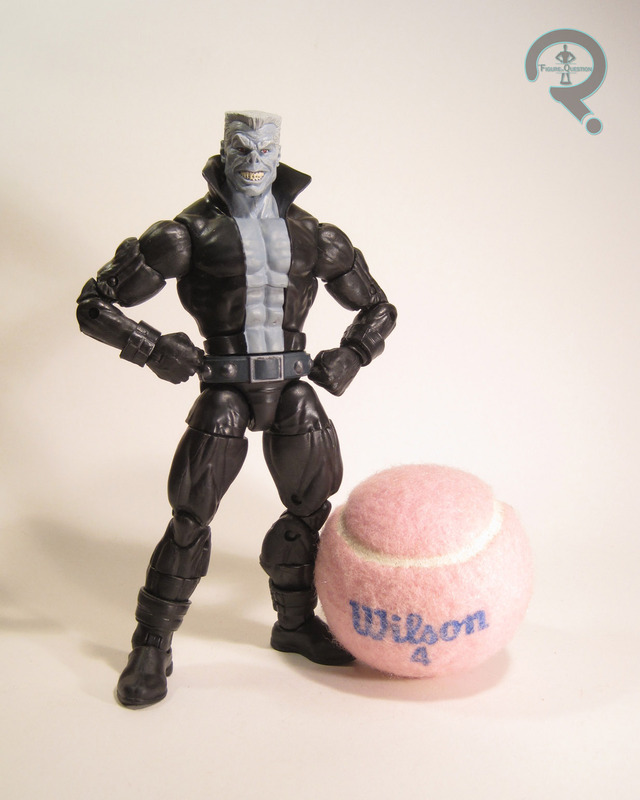 So, if you so desire, this guy doesn’t have to be a Spider-Man variant at all, which is very nice of Hasbro. The paintwork on this guy is generally pretty solid. Some of the application could be a little cleaner, but I’m really digging both the metallic blue and the pearlescent white. It looks really sharp. In addition to the two extra head sculpts mentioned earlier, Cosmic Spidey is also packed with the outer wing of Vulture’s wing-pack, the mirror of the one included with Moon Knight. Obviously, when this series was shown off, I was a little distracted by the Moon Knight figure, so I didn’t really pay Cosmic Spider-Man much mind. I actually passed this guy up a few times while I was out on the hunt for the rest of this series, since he wasn’t a priority of mine. But, after several unsuccessful runs, he was the only figure left at one of the Targets I checked, and I was desperate not to leave totally empty-handed. I also had a gift card, so that helped. He’s not a bad figure at all. Cool concept, cool design, cool execution. It all adds up to a pretty fun figure. So, uh, it’s Moon Knight, essentially, is what I’m, uh, what I’m getting at. Check it out. Yeah. Right about now. It’s, uh, it’s Moon Knight. Comin’ attcha. Yeah. Let me tell you, I really like me some Moon Knight. Well, I really like me some Moon Knight when he’s handled by a competent writer. Or at least one that doesn’t equate a split personality to being able to write him as literally possessing the personalities of Spider-Man, Wolverine, and Captain America all at once (gee, thanks Bendis). Current scribe Jeff Lemire is producing one of my favorite runs with the character, and my enjoyment of him is at an all-time high. Perfect time to release some action figures. 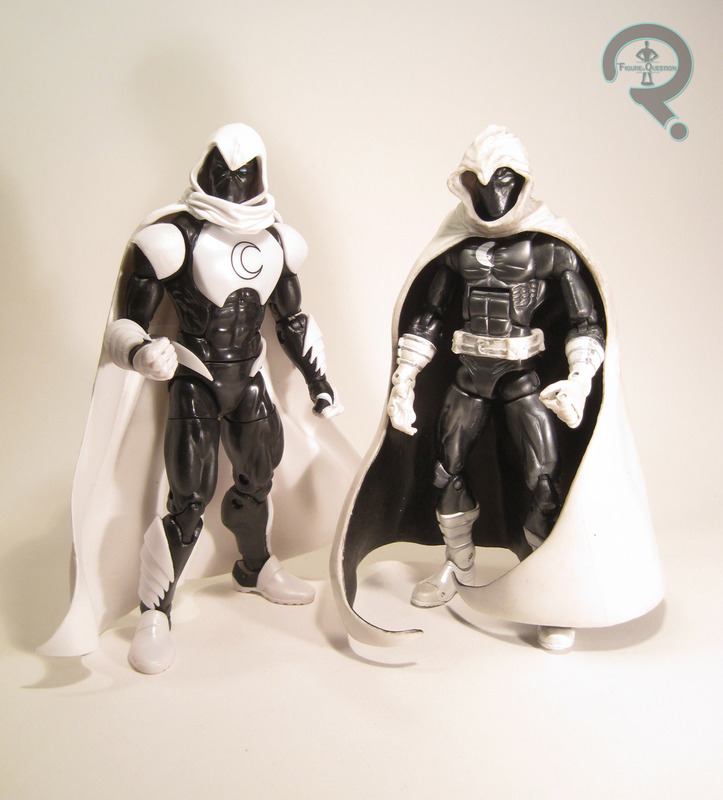 Fortunately for me, Hasbro totally agrees, and has offered Moon Knight in both scales of Marvel Legends. I already looked at the smaller figure three months ago, and today I’ll finally be following that up with a look at the main event, the new 6-inch scale Moon Knight! Let’s see how this guy turned out! Moon Knight—sorry, “Marvel’s Moon Knight”—is part of Hasbro’s latest Spider-Man-centered series of Marvel Legends, released to coincide with the release of Spider-Man: Homecoming. No, Moon Knight wasn’t in Homecoming (believe me, I would have made that fact known to everyone I came into contact with), but he’s loosely Spider-Man related, I guess. I mean, there was that time that Spider-Man was one of his split-personalities (again: thanks, Bendis). That’s sorta related; demented and sad, but related. This isn’t Moon Knight’s first time as a 6-inch Legends figure, but it is his first since Series 15 of Toy Biz’s run (a whole 11 years ago). This figure stands just under 6 1/2 inches tall and he has 32 points of articulation. 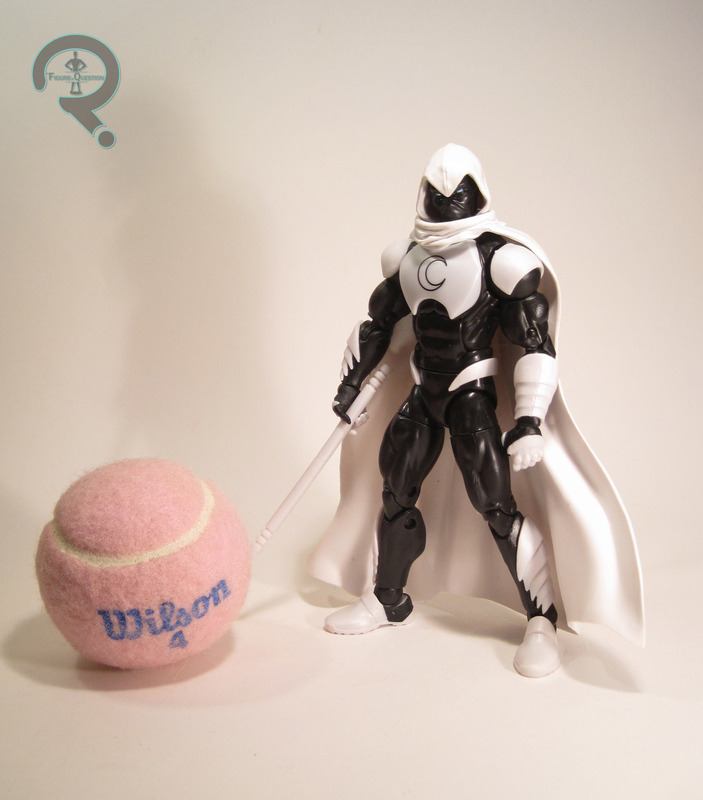 Like the smaller Legends Moon Knight from earlier this year, this Moon Knight is sporting his most recent costume. I know some fans were hoping for a classic all white Moon Knight, and while that certainly would have been cool, I still really dig this design. When this figure’s prototype was first shown off, there was a lot of discussion about which of the base bodies he was built on. In hand, he’s an almost entirely new figure. And oh boy, does that make for a really sharp looking figure, since it’s allowed for most of the body to be specifically tailored to Marc. 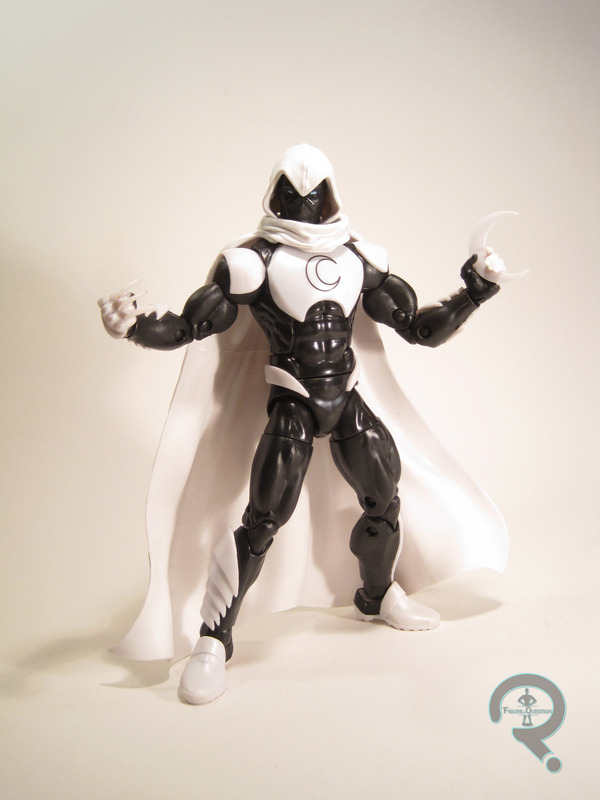 Though the body’s new to Moon Knight, it looks to have been built with re-use in mind. All of the armored pieces are add-ons, but rather than the usual floating pieces and rubber overlays that we tend to see on lines that rely more heavily on bucks, Moon Knight’s add-ons are all hard plastic pieces affixed to the body with pegs and glue. The end result looks very clean, and I can definitely see this making for more unique looking figures down the line. The basic build of the body looks to be somewhere between the 2099 and Spider-UK bodies, kind of taking up the slot that has typically been held by the faithful Bucky Cap body. 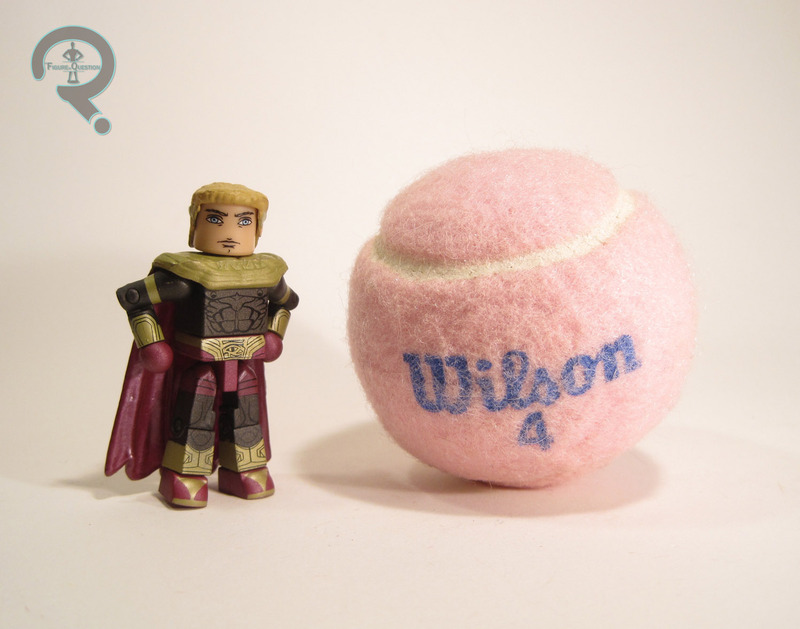 The only re-used piece is his head, which hails from the Hulkbuster Series’ Blizzard figure. It’s just a basic masked head, so it’s pretty sensible, and it’s even been given the all-new hood piece, so even placing the two figures side by side, they won’t look identical. Speaking of that hood, another selling point of this guy is his separate hood and cape, allowing for better posing options. His all-new cape works well with the head, and is definitely one of the better cape sculpts we’ve gotten from Hasbro. Great dynamic flow, but not so crazy as to limit his posing options or get too heavy. Moon Knight’s paint work looks fairly simple on the outside, but it’s actually really well-rendered when you really look at it. All of the armored bits are done in a pearlescent white, as opposed to the flat white of the cape and hood. Also, thanks to the separate pieces used for the armor, most of the pieces are molded in the proper colors, keeping things once and clean. As an added bonus, the few sections that do require paint apps remember the essential rule of dark over light. I cannot adequately express how happy that makes me. Remember how disappointed that the smaller Moon Knight included no extras? This guy makes up for that in spades. He’s packed with two sets of hands (fists and gripping), one large moonerang, three smaller moonerangs, and Daredevil’s billy club standing in for his usual staff. Perhaps my favorite part of all these extras is that the fists have slots between the fingers, allowing for the smaller moonerangs to be placed in-between on one hand or the other. It makes for a pretty awesome look. Moon Knight also includes the front of Vulture’s right wing, for those that care about such things. Oh wait, that’s me! Nice! Remember how illusive the Warlock Series Cyclops was? He’s got nothing on Moon Knight. I’ve been looking for this guy since May. After three months of searching retail with no luck, I finally gave up and started looking online. I was fortunate enough to be looking just as Amazon put up a small allotment of him for retail. Sold. I’m so happy to finally have this figure, and he’s gonna be giving that 90s Cyclops figure a run for that “favorite Legends to date” spot. It’s clear that someone at Hasbro’s a very big Moon Knight fan, and its translated into one of the best comic-based Legends that Hasbro’s ever produced. Zombies: everyone’s favorite guilt-free shooting target. In just about every iteration of modern zombie fiction, it seems like it’s only a matter of time before everyone has a gun and is lighting up the undead left and right. The fine people over at Hasbro certainly took notice of this trend when they started the Zombie Strike series of blasters back in 2013, a product line that persists to this day, which is a feat in and of itself. So what laid the groundwork for such a line? That’s what we’ll be looking at today with the Hammershot. The Hammershot was one of the very first Zombie Strike blasters, released in 2013 alongside the Sledgefire. The Hammershot is a 5-round revolver style blaster, which, itself is nothing new. What sets the Hammershot apart from other blasters like the Spectre REV-5 or even the Strongarm is its priming mechanism. Instead of a traditional priming slide which would require a second hand to operate, the Hammershot uses, unsurprisingly, a hammer style of prime that can be operated entirely one-handed. If you read my previous review, you’ll know that the premise of effective dual-wieldable blasters is quite alluring to me, so it should come as no surprise that I own a couple of these, thanks in part to my boy Ethan. The outer shell of the blaster is entirely original work and has a lot of really nice layering of plastic which gives it some visual depth. This is also helped by the use of this super cool, very subtle swirly metallic orange plastic which I believe is completely unique to this blaster. There’s some interesting texture work going on too with the faux wood grain and faux cloth wrap on the handle. I was skeptical of the cloth wrap at first because I thought it looked goofy and sort of out of place, but ergonomically it works just fine with no harsh lines or edges. The handle itself is rather long, extending well past the bottom of my hand, but the extra length does provide a nice amount of surface to grip while working the priming hammer with your thumb. 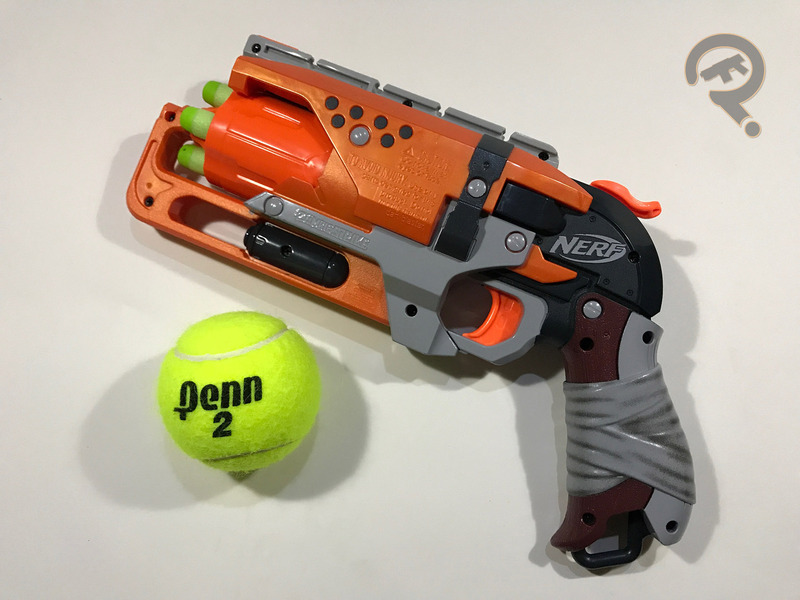 As something of a side note, the distribution of weight around the trigger as well as the larger grip make it very easy and entertaining to spin the blaster around your index finger like a gunslinger. In doing so, I’ve managed to fling mine into the floor several times without so much as a scratch, which speaks to the build quality of the blaster. This is probably largely due to the relative simplicity of the internal mechanisms and outer construction. 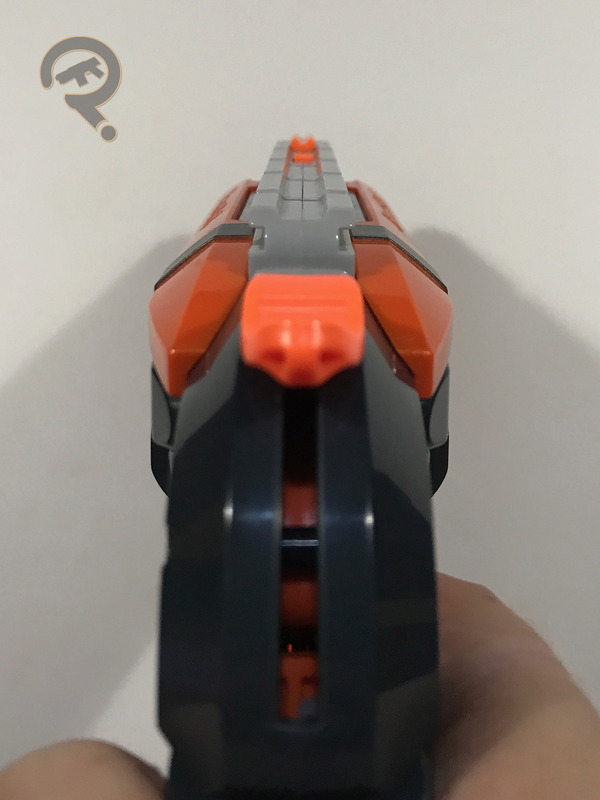 Unlike blasters such as the Spectre, the Hammershot has no barrel or stock attachment points though it does have a single attachment rail along the top of the blaster. The blaster performs admirably with shots flying far and hitting with substantial force. I would recommend it more for outdoor play and advise caution before using it to light up your younger siblings unannounced. 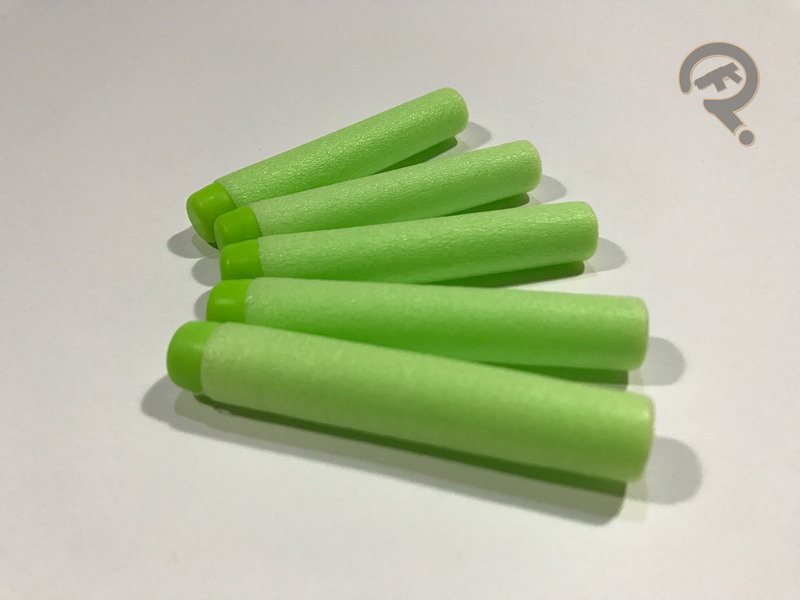 The Hammershot comes packaged with 5 Zombie Strike green Elite darts. 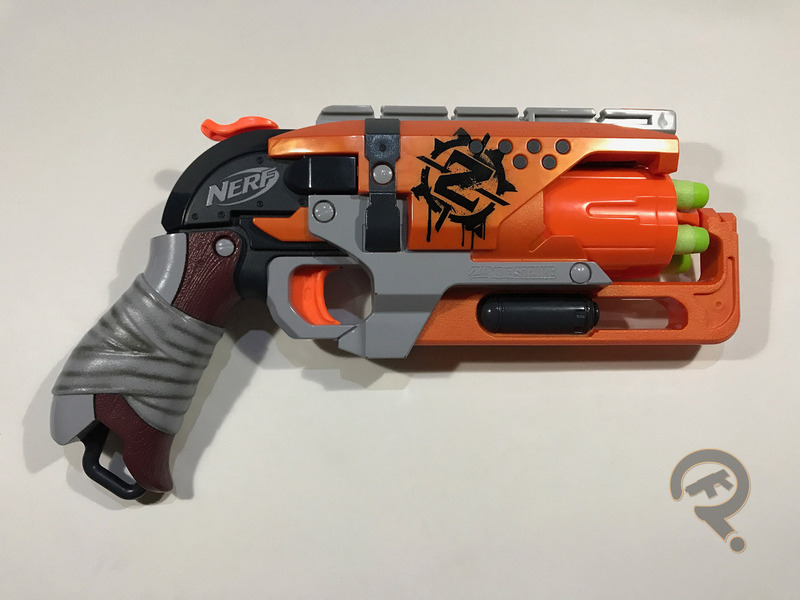 When the Zombie Strike line was first announced, for me, the Hammershot took the back seat as far as my attention goes. There had been more than a handful of revolver blasters over the years and the premise of the shotgun style Sledgefire overshadowed the Hammershot. While it’s true the Sledgefire may be the more mechanically interesting of the two, it’s hard to deny the sheer utility of the Hammershot. Wow, spoilers much? Not only do we know that Darth Vader’s Luke’s dad, but also that he kills Palpatine *and* sacrifices himself? This is a lot to process, you guys. Or it would be if I hadn’t seen the movies, I guess. 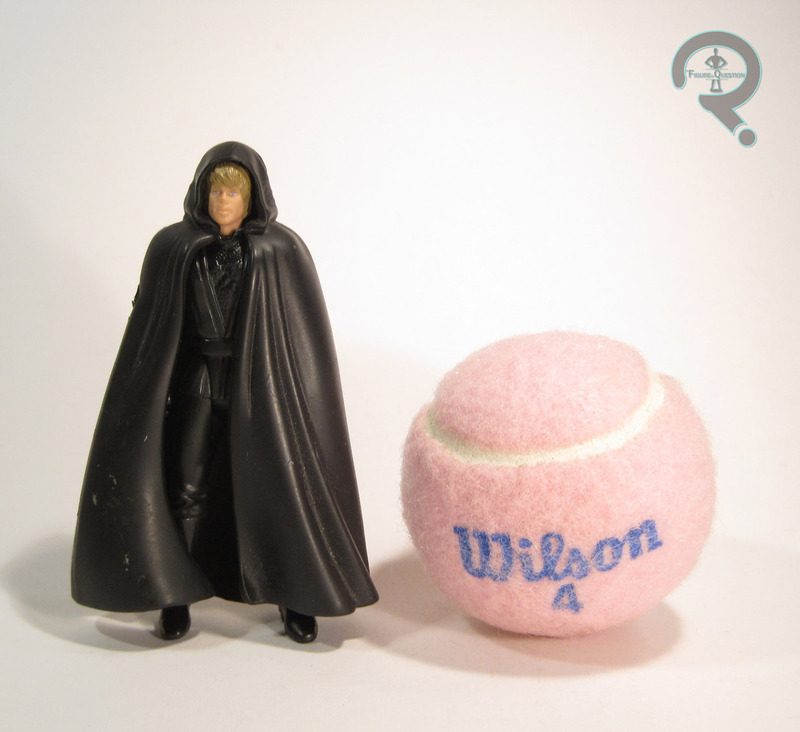 But then, what are the odds of me buying an action figure of Luke Skywalker? I’d say slim. But I have and I did, so now onto the review! 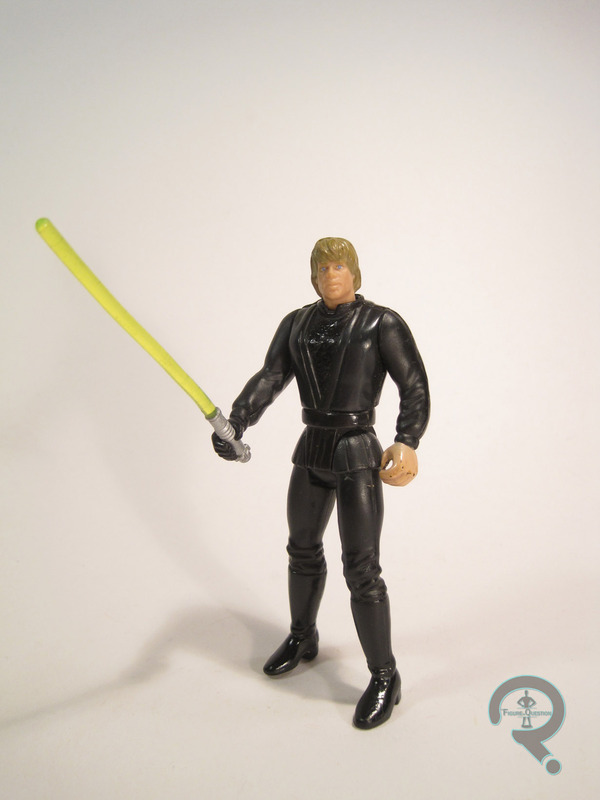 Jedi Knight Luke was released during the second year of Kenner’s Power of the Force II line. He was the fourth version of the character in the line, and the second that year. 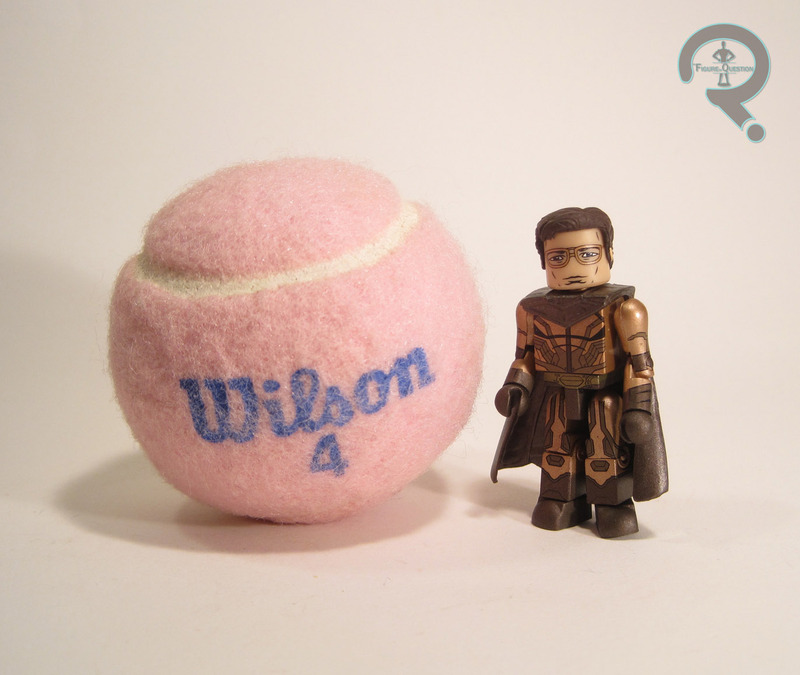 He’s based on his Return of the Jedi appearance. He’s sort of an amalgamation of the looks from that movie; for the most part, he’s from Luke’s introductory scene, hence the vest and the cloak. However, he’s also got the glove covering his damaged right hand, which he starts wearing after the scenes on Tattooine. He’s a horrible monster mash! Who could ever love him!?! Nah, it’s not really that big a deal. Anyway, the figure stands about 3 3/4 inches tall and he has 6 points of articulation. His sculpt is actually pretty tame for this line. Sure, he’s still got the same head sculpt that never looked much like Hamill, and sure he still looks like his pecs are about to burst out of his shirt, but all things considered, he’s really not bad. The proportions aren’t terrible, and he’s just in a fairly basic standing pose. The paint work on this guy is largely very basic. Mostly, it’s just black plastic, with a little bit of paint for the hand and some work on the face. There’s a tiny bit of glossier finish on the boots, which is a cool touch. The earliest samples of this figure actually had a tan/grey color for the vest, which made it stand out more, but this was eventually replaced with what’s seen on the figure in this review. The second figure is a little blander, but is also the more accurate look, so that’s fair. 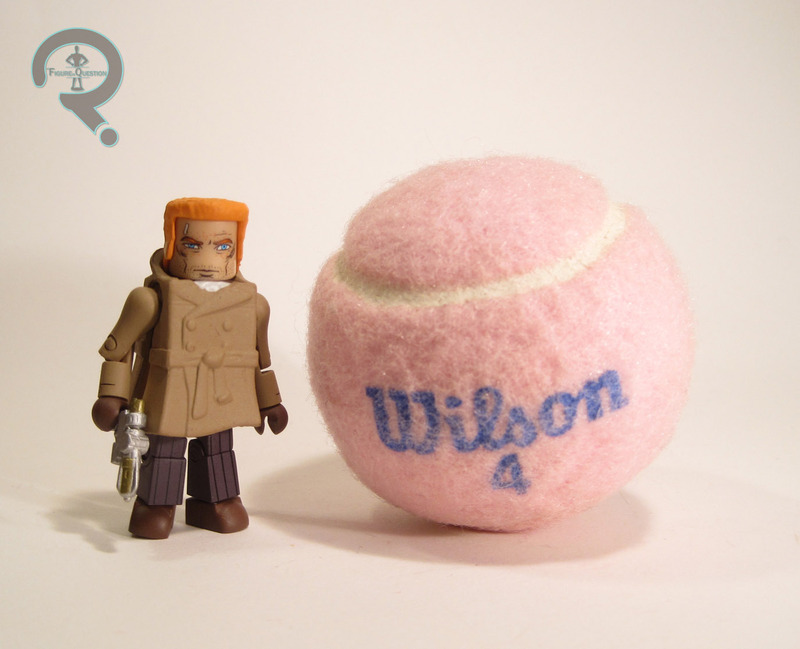 This figure was packed with his trusty green lightsaber, as well as a rubber cloak piece. Both pieces are fairly decent for the time, but do look slightly goofy by modern standards. Jedi Luke was the third version of Luke I got, after the Dagobah and Tattooine versions. I recall making a special trip to the local Toys R Us with my mom and dad, sitting in the middle seat of their Ford Ranger pickup truck. I also recall the figure’s distinctive smell wafting through the car on the ride home. Not long after I acquired this figure, it served as the inspiration for my Jedi Luke Halloween costume, which has the notoriety of being one of my favorite Halloween costumes pretty much ever. A lot of good memories are attached to this figure is kind of what I’m getting at here. You know it’s a bad pairing when even the bio on the back of the box describes the characters as “never close.” The last two days of Watchmen Minimates perhaps haven’t been the strongest partnerships, but at least they all had one or two key scenes together. Today? We got the left overs. Without further ado, Silk Spectre and Ozmandias! 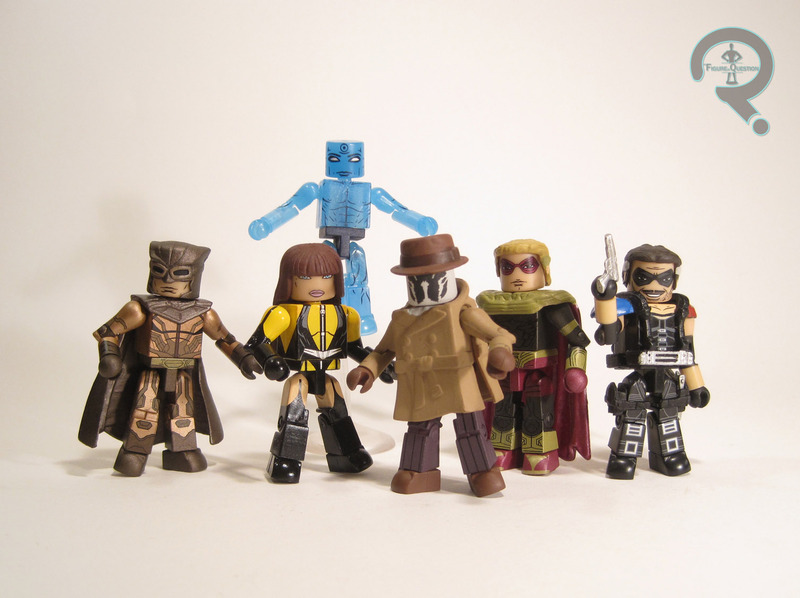 The prior two sets were made up of characters shared between the specialty four-pack and Toys R Us-exclusive assortment of Watchmen Minimates. Silk Spectre and Ozymandias, on the other hand, are both exclusively available in two-pack form through TRU. Why these two ended up as the exclusives is kind of hard to figure out; I personally would have swapped out Comedian and Laurie, but at the end of the day, it’s not a huge deal, I guess. Laurie Jupiter (It was Juspeczyk in the comics, but the movie never explains Sally’s changed surname or has Laurie correct Rorschach’s use of “Jupiter” when he meets her, so it sticks) is patterned loosely on Charlton Comics character Nightshade. Really, though, the only similarities the two share are a partnership with Captain Atom/Dr. Manhattan. Beyond that, they’re rather different. For the purposes of the movie, Silk Spectre’s look was rather changed. The basic spirit of the original look is still there, I guess, but it’s more generic catsuit now than it was originally. Meh. The figure is about 2 1/4 inches tall and she has the standard 14 points of articulation. Her only add-on is her hair, which is borrowed from Marvel Minimates’ New Mutant Magik. Given it’s a near perfect match for her hair in the movie, the re-use is certainly warranted. The rest of the work is done by the paint. It’s all pretty solid. She’s probably got the best paint in the series, to be honest. The colors are sharp and bold, and there’s very little slop. She includes a clear display stand and…that’s it. Seems a little light, but I don’t really know what you could give her. Maybe a more interesting character? Oh wait, they did! Jokes at Laurie’s expense aside, I can’t say Ozymandias is really a favorite of mine either. He does at least get to be the villain (spoilers?). He was originally meant to be Peter Cannon…Thunderbolt (yes, the ellipsis is part of his name) who never amounted to much on his own. Ozy’s design in the film looks rather different at first glance, but the only truly major change was making the main bodysuit dark grey instead of gold. It’s still the most easily distinguished of the designs, though. Like Laurie, he’s built on the standard ‘mate body. He gets add-ons for his hair, cape, and belt. The hair and cape are new pieces. They’re a little soft on the details, but look decent enough overall. In terms of paint, Ozy’s okay. Nothing truly amazing. The pale, non-metallic gold isn’t the best look, but the application’s fairly solid. The standard head sports his mask (seen only in flashbacks), but there’s also an extra head without the mask. That’s more than the DC Direct figure gave us! He also includes the usual clear display stand. Fun times. Well, those reviews kind of went out with a whimper, didn’t they? Sorry guys, I’m not trying to be a downer on this set at all. Neither ‘mate is bad or anything, but neither one is as strong as the other four. I really feel like splitting up this pair would do a lot to help both of them. With that said, once you’ve got the whole set together, it makes for a pretty sweet display. I’ve been waiting a long time for Watchmen Minimates, and while maybe I would have preferred comics-based ones, these are definitely a great set of ‘mates to have. Now, to hold out hope for a second series with some Minute Men! Right, the actual review. I should get to that! Here’s some more Watchmen Minimates! As noted by the bio, it’s Rorschach and Dr. Manhattan. Alright! 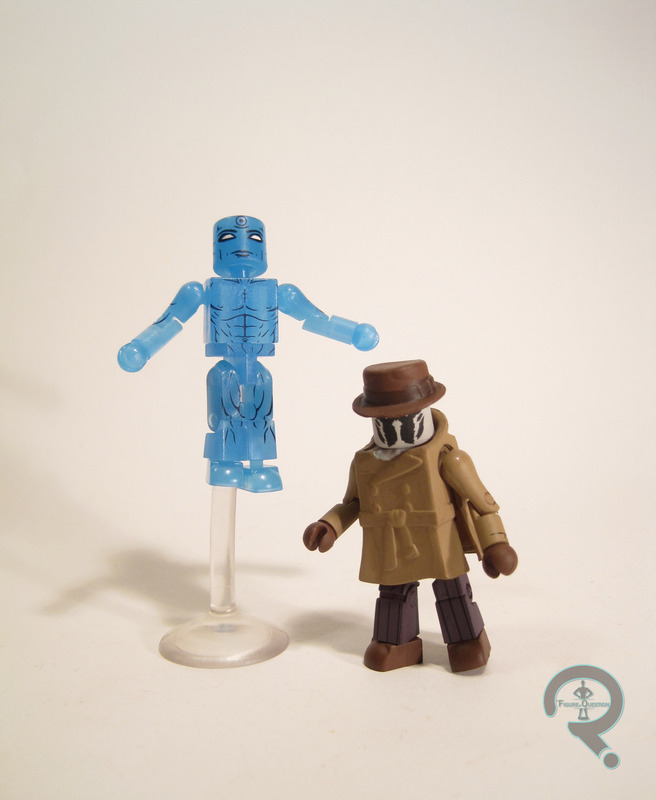 Like yesterday’s set, Rorschach and Dr. Manhattan are one of the “shared” pairs of Watchmen Minimates, available in both the specialty four pack and as a two pack in the Toys R Us’s assortment. Mine are the two-pack version, but they’re functionally the same. Rorschach is the closest the story gets to a main character, and is probably the most popular character contained there-in. He was originally intended to be The Question, and is honestly the least changed character in that respect. Rorschach’s design in the movie was completely unchanged from the comics, resulting in a ‘mate that can easily work for either version of the character. The figure stands about 2 1/2 inches tall and has the usual 14 points of articulation. He’s built on the basic body, with add-ons for his hat and coat. Both pieces are new to this figure, and they work pretty well. The coat’s a little on the bulky side, but it’s decent enough, and the hat’s one of the better takes on a fedora in this style. Rorschach’s paint is about on par with the pair I looked at yesterday. It’s pretty decent overall, but there’s some slight sloppiness on some of the base paint. The detail lines are also minimal on this guy, so it’s a bit less of what DST’s good at, but what’s there is pretty solid. Rorschach is packed with his grappling hook (a standard Rorschach accessory), as well as an unmasked head and hair, and a clear display stand. The extra head is definitely cool, and my favorite extra. The grapple is okay, but I can’t say I get why every Rorschach has it; I find it to be a rather minor piece. I would have much rather had the aerosol can he uses to escape the cops, or his journal. Also, the lack of extra heads with differing expressions is a little annoying. Still, not a bad selection. Dr. Manhattan is the story’s one true super human, originally planned to be Captain Atom. Visually, Manhattan is one of the story’s most memorable characters, and as such, his design remained essentially the same when they adapted the comic to film. Structurally, Manhattan is just a plain Minimate, with additional parts or anything. It’s certainly well suited to the character. It does mean that all of the heavy lifting is handled by his paint work. 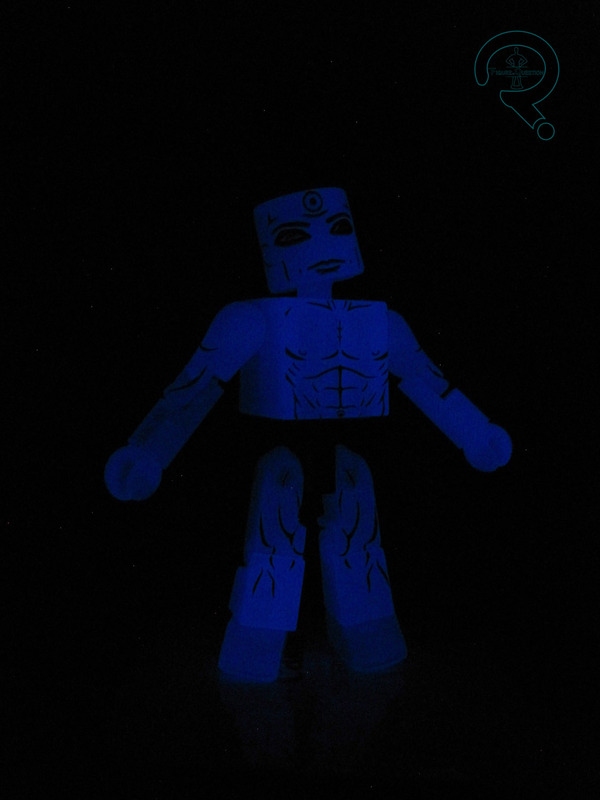 He’s done in a semi-transparent blue plastic, which, fun fact, is also glow-in-the-dark. It’s surprisingly powerful, provided you give it a little time to charge up. The detail paint on this guy is phenomenal. All of his parts have detailed musculature, and his face is a spot-on recreation of how he looks in the film. It should also be noted that this is the first Dr. Manhattan figure to forego the usual black shorts seen on all the merchandise. I mean, they still Ken-Doll-ed him; he’s still got to be decent and all, since he’s being sold at retail. Should you want him to be more modest, though, he does include an extra pelvis piece, molded in dark blue, thus replicating the shorts. In addition, he’s also got the standard display stand, as well as a flight stand. Like yesterday’s set, I picked this pair up from Toys R Us on my birthday. This pack is more comic-compatible than the last one, which is pretty cool. Manhattan’s just plain awesome, especially for being a ‘mate that could have been super simple and boring. Rorschach’s overall pretty decent, though I’m not sure he translated quite as well to the style. Still, not a bad set, especially if you’re a fan of the source material. Sometimes, I like to remember back when I didn’t totally hate everything Zack Snyder touched. His adaptation of Watchmen was just as divisive as anything else he’s done, but I was actually on his side of that one. Anyway, a whole eight years after its release, the film’s gotten a set of Minimates. I’m taking a look at the first pair, The Comedian and Nite Owl, today! 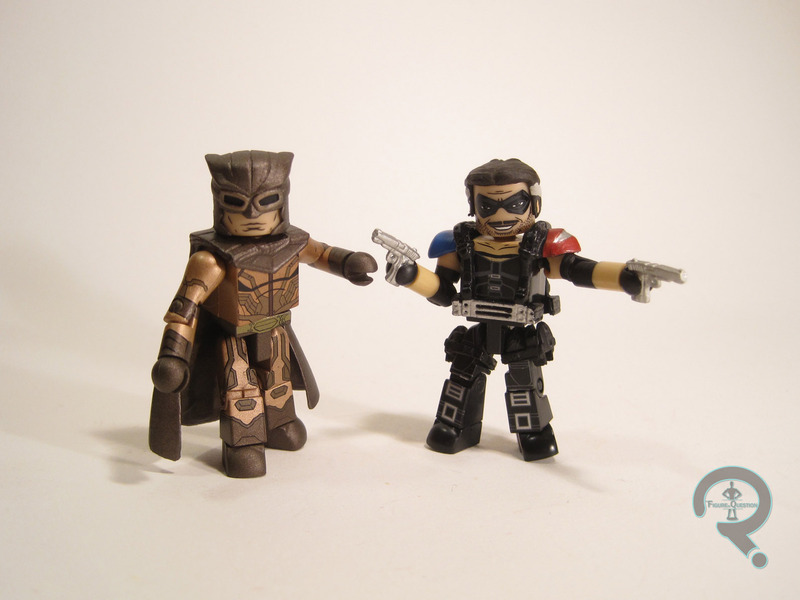 The Comedian and Nite Owl are one of the “shared” pairs of figures for Watchmen Minimates. 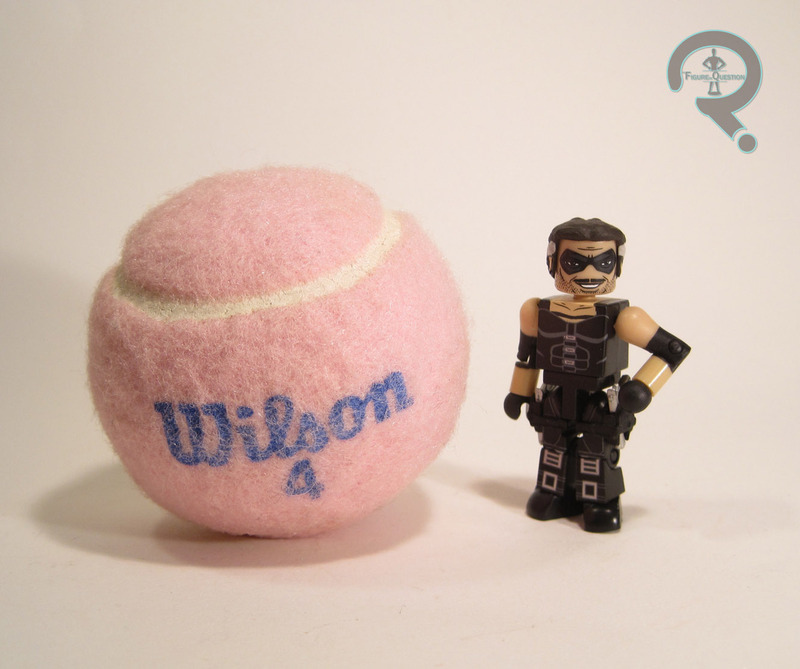 They were available both in the specialty four pack and as a two pack in the Toys R Us-exclusive assortment. Obviously, mine are the TRU versions, but there aren’t any real differences between the actual figures. Though he may be dead at the story’s start, the Comedian is perhaps Watchmen‘s most central figure. He was originally supposed be the Charlton Comics character “Peace Maker,” before DC forced the change. Shame, since it would have been perhaps the only noteworthy thing ever attached to the character. Oh well. Comedian’s look was largely unchanged when going from book to movie, so this guy will work pretty well as either version of the character. The figure stands roughly 2 1/4 inches tall and has the standard 14 points of articulation. In addition to the standard base body, Comedian has add-ons for his hair, shoulder pads/suspenders/belt, and the holsters. The holsters are the same basic pieces that have been in service since the Avengers Black Widow ‘mate, but the other two pieces are new to this figure. The new pieces are generally pretty solid additions. They could possibly have been a little sharper in terms of detail, but the work here is still pretty great. In terms of paint, Comedian is pretty decent overall. The best work is on the detail lines. The face capture’s not only Jeffery Dean Morgan’s likeness, but also his cocky Comedian personality, which is pretty cool. This is obviously a slightly older Comedian, though he does seem to be using any hint of his facial scar. I guess it was pretty downplayed in the movie. The base paintwork is a little sloppier than the line work, but still fairly decent. The biggest issue with the paint is actually something that was beyond DST’s control. He lacks Comedian’s signature smiley face button, due to rights issues associated with that particular image. DST has opted to drop the button entirely, rather than giving us just the blank yellow circle that other companies have gone with. I think I might like it better when it’s just not there; less distracting. Comedian is packed with a pair of silver handguns and a clear display stand. It’s a shame he didn’t get a few more weapons, and possibly an extra head and hair piece for a younger look, but what’s included is fair. Nite Owl is my favorite character out of the main Crimebusters in Watchmen (though, it’s actually his predecessor Hollis Mason that is my overall favorite character in the story), and it’s actually Patrick Wilson’s portrayal of him in the movie that helped me form that opinion. I find his book counterpart to be a little bland, but Wilson added a nice sort of lost everyman aspect to him that was endearing. Nite Owl was originally intended to be the Ted Kord version of Blue Beetle, another favorite character of mine. The movie design for Nite Owl was one of the more drastic changes, largely due to the simplicity of the original design; that sort of thing doesn’t tend to work so well on a large screen. Like Comedian, Nite Owl is built on the standard ‘mate body, with add-ons for his mask and cape. Both pieces are new to this figure, and are likely to stay unique to him, since I can’t really see them being of much use for any other characters. They’re both pretty decent pieces, though, like with Comedian, I think the details could stand to be a little sharper. The paint work on Nite Owl is pretty great. The work is all pretty sharp, and unlike Comedian, he’s not missing any essential details. The mask is removable, and reveals a fully detailed Dan Drieber head, glasses and all. I can’t say it’s a fantastic likeness of Patrick Wilson, but it doesn’t look unlike him. I guess he’s just got one of those faces that doesn’t translate well to the style. In addition to the usual display stand, Dan includes a spare hair piece for unmasked display. I think the piece is a little too suave for Dan, to be honest, especially if this is meant to be a “present” day Dan; it should be a little longer and more comb-over-y. It’s not awful, though. I do wish he included an extra mask with the goggles up, since he has that look several times during the movie. The Watchmen Minimates snuck up on me. At the time of the movie’s release, I was all over the idea of Watchmen ‘mates (in fact, I even made a custom set for myself, albeit a comic based one), but by the time they actually happened, I had largely moved past Watchmen. When the boxed set hit, I wasn’t sure about getting the ‘mates at all. But, I was out on my birthday, and I stopped at Toys R Us, and they had a full set, so I went for it. Getting the ‘mates even got me to sit down and watch the movie again for the first time in several years, and I enjoyed that quite a bit. This is my favorite pair of the ‘mates, and while there are certainly improvement that could be made, I’m very happy with them both.